"In 2005 a group of development professionals who had all worked in East Africa came together to set up an organisation, Liana.The aim was to facilitate members' efforts to link local development initiatives with expertise, resources, information and knowledge. One of the members, Eija, had been doing research in Kenya and Tanzania from 2000 to 2006 and identified many problems of lives and the environment in rural areas. She was particularly concerned about the lowlands surrounding Kilimanjaro, where it is hot and dry and hard to make a living, unlike on the iconic mountain itself. Liana has been running through voluntary work and members efforts since then. Starting in 2006 we did much fulfilling work in Moshi and Mwanga districts of Northern Tanzania, including establishing self-help groups, training builders, introducing the building of rainwater harvesting tanks, kitchen gardens, tree planting, fire-wood saving stoves and use of indigenous vegetables. A water supply that people can take responsibility for themselves is a key to all of these. Collecting rain water from roofs can provide a home with water for the whole year. 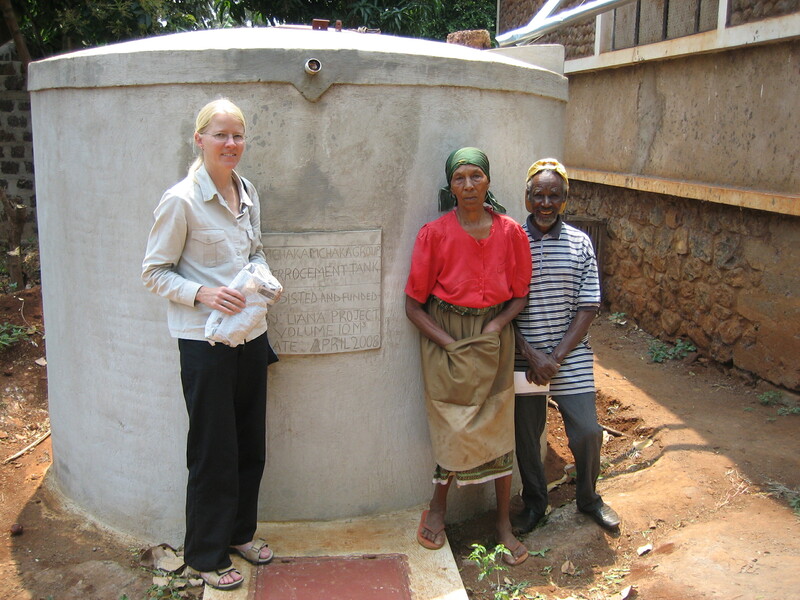 The tanks to store water are locally built, providing employment and meaning they can be repaired if necessary. A great team of builders has been trained and now works independently. They suggested training more builders in further villages so that the tank and stove technology could spread, and Liana supported that for several years. Then one of the builders, Ndanu, learnt how to make large tanks suitable for schools. We realised that working with schools is an effective way to reach larger numbers of people. Not only do all the children benefit, but the ideas introduced to the schools get taken up at home as well. Investigation with the district council in Rombo, between Kilimanjaro and the Kenyan border, revealed a huge number of schools that have no water supply at all and they prepare children's food on inefficient and smoky open fires. So we prepared a plan to build water tanks and stoves with those schools, progressing as fast as the money allows. The schools show their commitment by contributing some of the costs and providing collectable building materials like gravel and poles. They also accommodate and feed the builders while they are on site. So the task becomes a real collective effort involving the school and school children, the local community and the international supporters."